How Does Coconut Oil Kill Candida? Many people suffer from Candida infections without even knowing it. This yeast can overgrow in your body and cause different unpleasant symptoms that are difficult to diagnose, such as fatigue, bloating, cravings, weight gain, joint pain, acne, depression, mood swings and itchy skin. It is preferable to get a diagnosis from your doctor and follow the recommended treatment, but it is not harmful to follow a proper Candida diet and add some coconut oil to the mix to increase your chances of getting rid of Candida for good. Because Candida is yeast, it feeds on the carbohydrates and sugar in your diet, hence the intense cravings Candida sufferers may experience. For this reason, the Candida diet has the objective of depriving the yeast from its food source by eliminating grains, legumes, breads, pasta, rice, cereals, oatmeal, potatoes, corn, sweet potatoes, carrots, winter squash, fruits, milk, yogurt and sugar. The Candida diet emphasizes the consumption of high-fiber non-starchy veggies, protein from meat, poultry, fish and eggs, as well as healthy fats from avocado, olive oil and coconut oil. Coconut oil is often recommended as an adjunct to the Candida diet because of its special anti-microbial properties. Coconut oil is rich in saturated fats, especially medium-chain fatty acids, or MCFAs, from which everybody, especially Candida sufferers, can benefit. 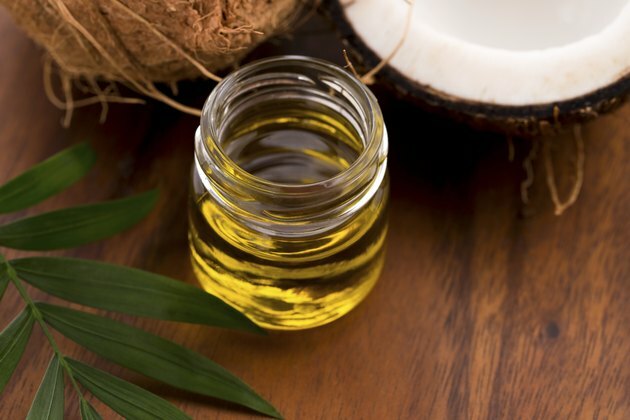 The MCFAs specifically found in coconut oil are called caprylic acid, capric acid and lauric acid. The special structure of these fatty acids allows them to attack the integrity of the membrane of Candida yeast, disrupting and disintegrating it, which leaves the interior of its cell, called the cytoplasm, disorganized and shrunken, as explained by researchers of the University of Iceland responsible for the study. This has been shown to kill Candida yeast without leading to the development of more resistant Candida strains observed with other anti-fungal treatments. The special medium-chain fatty acids, or MCFAs, found in coconut oil were found to be effective at killing different strains and species of Candida, as shown in the June 2007 issue of "Journal of Medicinal Food" and in the November 2001 issue of "Antimicrobial Agents and Chemotherapy." If Candida yeasts are killed too quickly, this can cause unpleasant die-off symptoms, caused by the release of toxins by the dying Candida. Die-off symptoms are usually experienced as an exacerbation of the symptoms associated with the Candida infection. To get rid of Candida effectively, you can start by adding small amounts of coconut oil to your diet every day and work your way towards a daily intake of about 3.5 tbsp. It is best to increase your intake of coconut oil gradually to reduce the die-off symptoms associated with the toxins released by the dying Candida. You can use coconut oil as you would use any other oil, for cooking your vegetables or meat or in baking instead of butter, shortening or oil. You can also consume it by the spoon, mix it with equal amounts of olive oil to prepare vinaigrette for your salad or mix it with equal parts of peanut butter for an enhanced peanut butter spread. Why Am I So Tired on the Candida Diet?